Azzan Yadin-Israel, Scripture and Tradition: Rabbi Akiva and the Triumph of Midrash. Philadelphia: University of Pennsylvania Press, 2015. 308+vii pages. $75. Azzan Yadin-Israel has presented us with a detailed and meticulous study of Sifra. This is a wonderful thing. 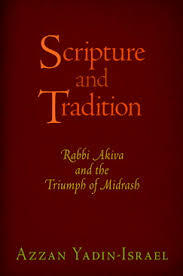 There is to date no other such study of the midrashic methodology of any work from the school of Rabbi Akiva. There is also no critical academic commentary on all of Sifra nor a full critical edition. Though Sifra was the most widely studied Tannaitic Midrash both in late antiquity and in the middle ages–there are more manuscripts, whole and fragmented, of Sifra and medieval commentaries on it than any of its counterparts – it was neglected in modern scholarship. Yadin-Israel’s willingness to undertake this project is laudable. Sifra is a running commentary on Leviticus. For the most part it is associated with the School of Rabbi Akiva. (Several segments of Ishmaelian Midrash, most importantly the Mekhilta de-Arayot, were incorporated into some Sifra manuscripts in the Middle Ages from the now lost Ishmaelian Midrash to Leviticus). Sifra is generally accepted to be a Tannaitic work, and its redaction predates the Talmud (Kahana; but cf. Stemberger). Some have claimed that it predates the Mishnah (Reichman). The book is made up of three parts. The first (caps. 1-4) attempts to characterize the exegetical methods of the unattributed Sifra. The second (caps. 5-7) is dedicated to the character of Rabbi Akiva in rabbinic literature and the statements attributed to him in Sifra. The third (caps. 8-9) is somewhat of a postscript, offering a comparative survey of other methods of interpretation in the Judaeo-Christian/late Roman orbit and situating Yadin-Israel’s work in the context of previous scholarship. Parts 1 and 2 of the book make bold claims. In the first part of the book, “A Hermeneutic of Camouflage,” Yadin-Israel sets out to find the hermeneutic assumptions and exegetical method of Sifra, only to discover that there is none. He reads through various homilies grouped by terms: words marked as redundant, the particle את, possessive pronouns, ribbui and mi’ut, and the tying of Mishnah to verse with the term mikan amru. He also devotes considerable space to finding consistency in the reading of certain words. Chapter 2, “The Sifra as Midrash,” is devoted to what Yadin-Israel terms “vacuity” and “semantic discontinuity,” which are, respectively, charging innocent words with midrashic meaning, and creating a derasha that does not flow logically from the verse. The conclusion of this survey is that though the anonymous Sifra might sound like Midrash – by going through the motions of marking words as redundant and inviting interpretation, by noticing various phonetic peculiarities and grammatical inconsistencies and so forth – it only employs midrashic rhetoric in “ex post facto constructions” to rework oral traditions into “Midrash.” Since the project is to find Mishnah in scripture – at all costs – it is no surprise that the anonymous Sifra throws consistency and even coherence to the wind, and engages in “tautological, solipsistic, or otherwise empty arguments” (p. 100). But wait, you say, isn’t Sifra associated with Rabbi Akiva, the man who in popular imagination could pile heaps and heaps of interpretations on the tip of one letter? Should we expect any less than that from a work associated with him? In part 2, “A Curious Career,” Yadin-Israel unequivocally says that this is not the Rabbi Akiva presented in the attributed Tannaitic material. In fact, claims Yadin-Israel, after examining the traditions attributed to Rabbi Akiva in Sifra (in Chapter 6) his homilies are more similar in terminology and method to the ones found in the Ishmaelian Midrashim (Mekhilta de Rabbi Ishmael and Sifre Numbers) than to the anonymous Sifra. Even an examination of the biographical traditions about Rabbi Akiva in Tannaitic literature shows him to be a product of the rabbinic academy from childhood, not at all the revolutionary outsider we know and love from the Babylonian Talmud (Chapters 5 and 7). Yadin-Israel’s claims are not abstract or ungrounded. To buttress them, he offers a large textual corpus in translation, helpfully reproduced in Hebrew from MS Kaufmann A 50 (for Mishnah) and MS Vatican Ebr. 66 (For Sifra, all on pp. 213-229). It is a richly documented book, which offers thoughtful textual analysis on every page. Yadin-Israel engages refreshingly in textual scholarship. In lucid and beautiful prose he takes the reader along with him on what is (for Yadin-Israel) an ultimately futile quest for meaning in the anonymous Sifra. I enjoyed engaging with each source immensely, even where I did not agree with the conclusions. It is this disagreement that I will lay down below. In Chapter 9, Yadin-Israel notes that his claim – that Sifra does not engage in creative legal hermeneutics, but in some other project – is not new. The main stream of rabbinic scholarship in the early twentieth century was of the opinion that halakhah is “Oral Law,” what Josephus called paradôsis, “tradition.” Perhaps at some point in time rabbis shifted from “tradition to commentary,” and perhaps not, but the creation of the bulk of rabbinic law was grounded in the former, not the latter. Yadin-Israel’s innovative claim here is that both tradition and commentary were appealed to as sources of authority at the same time, but in different Tannaitic schools: Rabbi Akiva was grounded in tradition, Rabbi Ishmael in commentary. Notwithstanding Yadin-Israel’s modifications of the basic thesis of midrash mekayyem or, in his terms, midrash somekh, he is (in my opinion) coming almost full circle, upending several decades of the study of Midrash. Daniel Boyarin in his Intertextuality and the Reading of Midrash tentatively suggested that Midrash should be read as commentary on scripture. His suggestion became so successful that, against this backdrop, Yadin-Israel can qualify and hedge: Midrash is not always commentary and works that call themselves “Midrash” are sometimes something else. Like a front for connecting oral traditions to scripture. And herein lies the rub. Maybe – just maybe – If the anonymous Sifra rhetorically presents itself as Midrash, its claims should be taken seriously. I would like to take up a few of Yadin-Israel’s examples in the first part of the book and see whether they have exegetical ground after all (I will use Yadin-Israel’s numbering scheme for the quotations, preceded by a §). When a man or a woman has spots on the skin of the body, white spots, the priest shall make an examination, and if the spots on the skin of the body are of a dull white, it is a rash that has broken out on the skin; it is pure. בוהק טהור. מלמד שהבוהק טהור. A rash is pure – this teaches that a rash is pure. “בוהק” “טהור”. מלמד שהבוהק טהור.יכול לא יטמא משם אום. אבל יטמא משם פיסיון. תל’-לו’. ”הפורח טהור”.יכול יטהר את הבהרת שיצאת ממנו. תל’-לו’. “הוא”. יכול לא יטהר את הבהרת שיצאת ממנו. אבל יטהר את הבהרת שניסמך לה. תל’-לו’. “בוהק הוא”. “טהור הוא”. הוא טהור. אין הבהרת שיצאת ממנו ושניסמך לה טהורה. אילא טמאה. Could it not cause purity to the leprosy (בהרת) which protrudes from it, but cause purity to the leprosy that it spreads to? It teaches, saying “it is a rash” “it is pure.” It is pure, but the leprosy that protrudes from it and that it spreads to are not pure but impure (Negaim, ed. Weiss 67a). Read in entirety, the homily is parsing the verse, dividing it up into small units, each with its own meaning: “the rash is pure,” “that has broken out is pure,” and then the two occurrences of הוא, which are read as limiting the purity of the rash to the rash itself and leprosy which protruded from it or which it might have touched. None of these readings is self-evident, and other readings of the verse are possible. Who is the referent of the second הוא: the person (see e.g. Vulgate) or the rash? Is the rash pure, or is it only pure if it breaks out in the skin, but not otherwise (see the insistence of the Septuagint on the former). Reading the verse requires parsing it into constituent parts and explaining them, which is what hermeneutics is by definition. Yadin-Israel (p. 22, quoting a different part of the homily as §1.14), claims that the “phrase tahor hu is a necessary component of the verse because it identifies the referent of ‘pure.’” In this, Sifra also clearly disagrees with him: It clearly states: ‘“Rash” “pure” – this teaches that a rash is pure.’ The homily explains that (1) it is the rash, not the person, that is pure, and (2) that the rash is ipso facto pure, not just if it spreads. The details derived from the components of the verse now make sense as well (cf. p. 55): only the rash is pure (בהק – טהור הוא), but its spreading does not cause purity to leprosy (פרח בעור – טהור הוא). Parsing it this way, Sifra’s reading method makes many of the incongruities Yadin-Israel points out, well, congruent. Also, even if the derasha were tautological and meaningless, Yadin-Israel does not explain to what end. There is no Mishnah or Tosefta that could be the source for this homily. You shall lay your hand on the head of the offering and slaughter it at the entrance of the tent of meeting; and Aaron’s sons the priests shall dash the blood against all sides of the altar. “בני אהרן”. יכול חללים. תלמוד לומר. “הכהנים” יצאו חללים.ואוציא חללים ולא אוציא בעלי מומין?תלמוד לומר. “בני אהרן”. מה אהרן כשר. אף בניו כשרין. “Aaron’s Sons.” Could this refer to disqualified priests (halalim)? It teaches saying: “the priests,” to the exclusion of disqualified priests.Might I exclude disqualified priests, and not exclude handicapped priests? It teaches, saying: “the sons of Aaron.” Just as Aaron is qualified, so his sons are qualified.Thus disqualified and handicapped priests are excluded (Nedavah, ed. Weiss 6b). Note that I modified Yadin-Israel’s translation here: halalim are definitely not “laypersons”(p. 29). They are disqualified priests, the masculine plural form of חללה in Lev 21:7 and 21:14 (see Jastrow). Yadin-Israel says the derasha “merely cites the word ‘priests’ and asserts the analytically true fact that priests are not laypersons” (p. 29). But it is not so: the derasha wants to account for the verbosity of the verse. Why say “Aaron’s sons the priests” and not one or the other? The answer is that each name accounts for a different group of marginal priests or Aaronides who are excluded: the halalim, Aaron’s sons but not priests, and the handicapped, priests but not Aaron’s sons. Yadin-Israel again says that this reading is “plainly opposed to the Ishmaelian notion of hermeneutic markedness” (p. 31), but this does not mean Sifra does not have its own notions of markedness or of hermeneutics which it is trying to convey through its homilies. Sagiv’s findings that Tannaitic statements in Sifra tend to clump around problematic verses do not show that the anonymous Sifra is not interested of making sense of each and every redundancy in all of Leviticus. In Chapter 4 (p. 99) Yadin-Israel asks about the same homily: why does Sifra not simply cite Leviticus 21:21 to show that handicapped priests are disqualified? That would be an appropriate question if Sifra were attempting to prove that handicapped priests are disqualified, i.e. if Sifra was merely a cover for extra-scriptural traditions. However, if Sifra is interested in responding to the redundancy, citing Leviticus 21:21 would not help at all. (The homily might also be responding to an anomaly in Lev 21:21 which refers to “men who have blemishes from the seed of Aaron” rather than the standard “sons of Aaron,” pointing to the fact that the latter phrase denotes non-handicapped priests). The same reading technique can solve Yadin-Israel’s issue with homilies that employ the terms yakhol and minayin together with Talmud lomar which return to the same verse (Many, even most yakhol and minayin derashot, do not return to the same verse. In chapter 2, Yadin-Israel is careful to say that not all homilies do; but cf. p. 206.) While Yadin-Israel says they are “empty,” these terms establish the “hermeneutic markedness,” i.e. the redundancy, of one or another of the elements in the verse, setting it up for the interpretation at the end. Yadin-Israel has the same issue with din (i.e. kol va-homer) arguments which conclude with the same glossed prooftexts that preceded them (e.g. p. 63, §3.12 and pp. 64-67, §3.13). Here too Sifra is working to establish markedness. In these cases, the homily points to a redundant grammatical element (e.g. אתו) and glosses it with a halakhah. Then it introduces a din argument for the opposite of the halakhah. Then it concludes (talmud lomar) that the redundant element was required to negate the din. The fact that the formulae do not distinguish between the same verse and different verses might show that for the Sifra, redundancy is an issue whether it manifests itself in the same verse or in different verses. Beyond that, however, Yadin-Israel seems to be setting up a dichotomy between “tradition” and “commentary” which seems to me unhelpful. Many mishnayot are based not on “tradition” but on “commentary.” Yadin-Israel’s example §4.18 is a case in point. On p. 94 he compares Mishnah Shevu’ot 3:5 to Sifra Hovah (Weiss 23c) and tries to determine the relationship between them. This is a tricky relationship indeed (it would have been better if Yadin-Israel had offered readers more of the Mishnah in context). But Mishnah Shevu’ot here is anything but an “extra-scriptural tradition.” The Mishnah presents a debate between Rabbi Akiva and Rabbi Ishmael regarding scriptural interpretation. They both employ the term ribbuy ha-katuv, “the inclusive language in the verse.” Many other mishnayot are based on scriptural interpretation as well (as Ch. Albeck notes sometimes in the addenda to his Mishnah commentary). Even if the Sifra here post-dates the Mishnah, and is (as Yadin-Israel explains) attempting to solve an apparent problem in the Mishnah, it does not follow that the Sifra is a mere foil for grounding extra-scriptural traditions in scripture. Quite the opposite: the Mishnah here is engaging in Midrash as well. A similar approach can resolve Yadin-Israel’s issue with Menachem Kahana’s reading of Mishnah Gittin 9:10, Sanhedrin 3:4 and Sifra Metzora (Weiss, 79c), on pp. 209-210. There are, to be sure, homilies in Sifra which serve to “unite the Dual Torah,” to use Jacob Neusner’s turn of phrase, by coupling mishnayot with homilies (e.g. §2.19, §2.20, §3.4 and many more). But even these have an interpretive effect on scripture. For example, the list of blemishes in persons in Mishnah Bekhorot 7:6 (p. 98; on the list see Rosen-Zvi) is cast in Sifra (§2.21) as a homily on Leviticus 21:21. The contents of the list are clearly not derived from scripture. But claiming that they are anchored in a ribbuy, איש איש, is in itself an interpretation of the verse which makes the verse speak the language of the rabbis. It is not the kind of self-referential hermeneutic that Yadin-Israel attributes to the school of Rabbi Ishmael, but it is a hermeneutic nonetheless. It is the same kind of hermeneutic that fuels, for example, the Palestinian Targumim, which can go on a homiletic tangent while reading a verse. To those who have the Oral Torah, it can be found everywhere, not least in the Written Torah. (I would also add that in Leviticus 10:9 drunken priests are only forbidden from entering the tent of meeting – not officiating at the altar, and so the Mishnah here is not circumventing scripture). I think the examples here are sufficient to prompt readers to check the evidence for themselves and engage with the examples, as Yadin-Israel has so generously invited us to do. Yadin-Israel’s general theory is an impressive and beautifully argued paradigm, but it is based on the cumulative textual evidence and must be examined against a careful reading of the original texts in context. As for the second part of the book, Chapter 5, Yadin-Israel’s intertextual reading of the Akiva and Moses encounter in Bavli Menahot 29b is innovative and thought-provoking. It would be better for Yadin-Israel’s paradigm of the Sifra, however, to adopt Shlomo Naeh’s suggestion that Rabbi Akiva sat and “expounded heaps and heaps of halakhot on each pericope (קוצה) of the Torah.” This sounds much like Yadin-Israel’s description of the anonymous Sifra: a work intent on pairing up extra-scriptural traditions with verses. Interestingly, Moses did not understand this endeavor at all, and was only satisfied when he was informed that an extra-scriptural law was just that: “a tradition to Moses from Sinai.” (For another use of כתב in this context, see Sifre Dueteronomy 26, ed. Finkelstein, 65). Chapter 6, on the relationship between Rabbi Akiva’s homilies and the anonymous Sifra is important in that is highlights the differences between named and anonymous homilies in Sifra in a systematic way. It is a good starting point for sustained and systematic inquiry on this relationship, although Yadin-Israel sometimes goes too far in differentiating named Rabbi Akiva homilies from those of the anonymous Sifra. I would add that though Yadin-Israel is noncommittal on the date and provenance of this layer, it is clearly cited in the Talmuds. Sifra is also “Tannaitic” in both language and content. The existence of multiple strata in Sifra (as in any Tannaitic work) does not make any of them less “Tannaitic” than the other. It shows quite nicely that there were programmatic and hermeneutic developments in the school of Rabbi Akiva. Chapter 7, sadly, leaves me unconvinced on philological grounds. Yadin-Israel successfully shows that there are traditions that make Rabbi Akiva a member of the rabbinic community from childhood, but works unsuccessfully to discredit the Tannaitic tradition, in Sifre Deuteronomy (with a parallel in Genesis Rabbah), that casts him as someone who was an ignoramus until forty. ר’ עקיבה למד תורה בן ארבעים שנה. ר’ עקיבא עשה בור ארבעים שנה. (2) The reading of MS London of Sifre Deuteronomy, that Rabbi Akiva learned Torah for forty years (למד תורה ארבעים שנה), waited on the sages for forty years and then led Israel for forty years, leaving him no time to be an ignoramus, is not corroborated by any other manuscript evidence. (3) The Sifre Deuteronomy fragment Yadin-Israel cites, (MS Holon 242 ה) is not a Genizah fragment but a late medieval Sephardi Fragment of Sifre Deuteronomy brought to Israel from Yemen. Its reading, עסק בעולם, is a reworking of the Genesis Rabbah tradition, perhaps even a graphic corruption (עסה>עסק and בור>בע’>בעולם). (4) Yadin-Israel cites Midrash Hagadol to Genesis which reads that R. Akiva עשה בלא תורה for forty years, but this is a reworking, again, of Genesis Rabbah (with בלא תורה replacing the disrespectful בור, perhaps another graphic corruption of בור>ב’ ת’>בלא תורה). Midrash Hagadol on Deuteronomy 34:7 has the same reading as all the other Sifre Deuteronomy manuscripts. (5) More importantly, the other three characters who died at 120 listed in the tradition in Sifre and Genesis Rabbah all spent forty years outside of the world of Torah. Moses was in Egypt, Hillel the Elder came from Babylonia and Rabban Yohanan b. Zakkai was a merchant. To fit this pattern, Rabbi Akiva must have started learning at forty. I am interested to know why the existence of this tradition is so troubling to Yadin-Israel’s thesis. Could there not simply be two traditions about the early career of Rabbi Akiva? This however does not diminish from the importance of Yadin-Israel’s effort to reintroduce rabbinic biography back into the study of the Tannaitic traditions themselves. The derashot are supplied in translation (and sometimes in the original) without their original lemmata. This decision caused a blatant error on p. 56 (§3.2), in which Leviticus 11:2-3 is supplied as a lemma for an excerpt from a complex and difficult homily on Leviticus 11:24 which happens to cite Leviticus 11:2-3. Yadin-Israel points to this homily as an example of “extreme semantic discontinuity,” but this is alleviated if read in context and in conjunction with the correct verses. Similar but less severe problems can be found in §2.10; §2.17-18 (in §2.17 the verse is Lev 15:18, not 19); §2.38; §2.37 (Lev 15:25 is quoted erroneously, skewing the entire homily). It also blurs the choices Sifra makes out in delimiting the lemma, as I pointed out above. Sources are sometimes truncated, leading to problematic conclusions and impressions (e.g. §3.2, §3.14, §4.18, §10.1, as well as the motto at the beginning of chapter 8). Some of the translations are inaccurate and need revising (e.g. sources §2.6; §2.14; §2.32; §3.7; §3.16; §4.18; §6.6; §6.9; §6.15; as well as on p. 106, 130, 175, 184, 193, 197-8). Sometimes the English translations do not reflect the language of MS Vat. Ebr. 66 reproduced in the back of the book and are based on the vulgate editions (e.g. §2.21; §2.31; §2.35; §4.11; §6.23). The quotation of Sifre Numbers on p. 173 is not based on MS Vat. Ebr. 32 which reads אין “חלום” אלא שיש לו פתרון, which reading solves the discontinuity Yadin-Israel found there. The Hebrew of §2.34 is copied from the vulgate editions, not MS New York. All these should be corrected in a future edition. Other than that, the book is beautifully laid out, copyedited and indexed (On p. 188: committed should be commitment; the author of the MA thesis on Sifre Zutta Numbers is not Hillel, but Hallel Baitner). When all is said and done, I had a wonderful time reading this book, marking it up and arguing with it. It goes back to basics and offers a comprehensive statement about those basics. Let the conversation begin.